The son-in-law of Jan Brueghel and a friend of Peter Paul Rubens, Teniers achieved success in Antwerp and then moved to Brussels, where he served as court painter to the archduke Leopold Wilhelm and later to Don Juan of Austria. 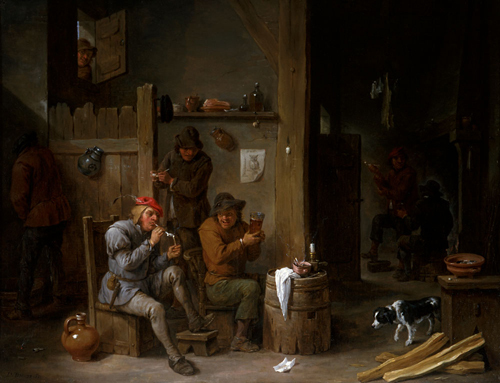 Tavern Scene is one of numerous genre paintings in which rustics carouse, uninhibited by notions of propriety or temperance. Such subjects frequently served a moralizing purpose, indicated here by the drawing tacked to the wall above the laughing drunkard. The bird flanked by eyeglasses and candlestick may illustrate the proverb, "What use candle and spectacles if the owl cannot and will not see?"